Visit Aerospace Engineering on FaceBook to see more photos from the event! 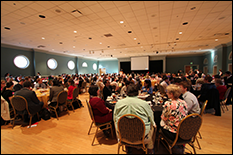 Nine Aerospace Engineering undergraduate students were recognized for their achievements during the 2014 A. James Clark School of Engineering Honors and Award Ceremony held April 10, 2014 at the Stamp Student Union, Colonial Ballroom. Family, friends and faculty were on hand to celebrate as this year's students were awarded for their excellence in scholarship, leadership, outreach and service. This award recognizes those graduating seniors in the department who have attained the highest overall academic average. These awards are presented to those juniors in the department who have attained the highest overall academic average. This award recognizes the student who has made the most outstanding contribution through scholarship and service to the student branch and the department. Walters is a junior Aerospace Engineering student at the University of Maryland, College Park. She is an undergraduate research assistant in the Aerosmart Smart Materials Lab at the University of Maryland and has been a member of the UMD student chapter of the American Institute of Aeronautics and Astronautics since her freshman year, serving first as a liaison and then as president. Samantha worked as an intern at NASA’s Jet Propulsion Laboratory in Pasadena, California the summer of her sophomore year and will be returning this summer to work on the Mars Science Laboratory Curiosity rover. She is also an active member of Alpha Omega Epsilon, a professional engineering sorority. This award recognizes those students who have made the most outstanding contribution through scholarship and service to the student chapter and the department. Reich is a junior Aerospace Engineering student and Service Officer for the Sigma Gamma Tau aerospace honors society. He has spent much of his academic career involved in volunteer humanitarian efforts in the U.S. and abroad, including dormitory and orphanage construction, poverty alleviation, and reforestation. After graduation, Kevin hopes to work for NASA’s Jet Propulsion Laboratory to develop planetary rovers. This award is presented to students for their dedicated service to the Center for Minorities in Science and Engineering, the University community and commitment to promoting diversity in engineering. Palacio is a sophomore Aerospace Engineering student and is the Junior Chair for the Society of Hispanic Professional Engineers (SHPE). She is also a part of Flexus: Women in Engineering Living and Learning Community. During Gladys’ freshman year, she participated in the High Altitude Balloon Payload Project with Dr. Mary Bowden in the Space Systems Laboratory. Over the summer, Gladys was a program coordinator and teacher for the Engineering Science and Technology to Energize and Expand Young Minds (ESTEEM/Ser-Quest) program run by the Center for Minorities in Science and Engineering. She works as a Clark School Ambassador to talk to prospec­tive high school students about the engineering field. This award is presented to a senior for their scholastic excellence and demonstration of outstanding service and leadership to the Clark School of Engineering. Sullivan is a senior Aerospace Engineering student with a minor in Engineering Leadership Development. He is a member of the University Honors and Aerospace Honors programs. He is also an active member and previous president of the local chapter of Theta Tau, the nation’s oldest professional engineering fraternity. He is a past member of Team Gamera and has completed an internship with Sikorsky Aircraft. He enjoys traveling and has studied abroad in Australia, the United Arab Emirates, and Qatar. Currently, he serves as a Clark School ambassador and a teaching fellow for Introduction to Engineering.